I am pleased to report we have updated our Website so we now have a trendy “blog”. Seriously this will allow us to keep in closer touch with those of you who support the L o F, and of course those who we hope have benefitted from our support for the hospital. We are as you know deeply indebted to the work over many many years, of our Chairman Bernard Trew. So I thought it was appropriate for him to write a few words to welcome in our new online facility. “Our goal is to raise funds in order to help provide a level of care, beyond that which the NHS can provide alone, and allow staff to achieve and maintain the high quality standards they set for themselves. Since 1958 The League of Friends in Uckfield have raised and provided the funds for a number of important projects and pieces of equipment, which have been of great service to the local community. These causes have been funded through the tremendous generosity of local residents, who have consistently backed our organisation in helping Uckfield Community Hospital through legacies and traditional fundraising, with the benefits in turn received by those in need of the care of our local doctors and nurses. As Uckfield as a region has grown, so too has the Hospital expanded and upgraded the services it provides; including the Millwood unit for mental health, minor injuries, operating theatre, dental services for the disabled, and wards to name a few. The League of Friends volunteers have given their time and energy to the cause of assisting our local hospital wherever possible, helping to ensure that expansion and growth take place alongside the growing town in which we reside. If you would be interested in giving your time to help the League of Friends and our local hospital, please don’t hesitate to contact us using the information provided on this website. The trustees meet bi-monthly, and we hold an annual AGM. 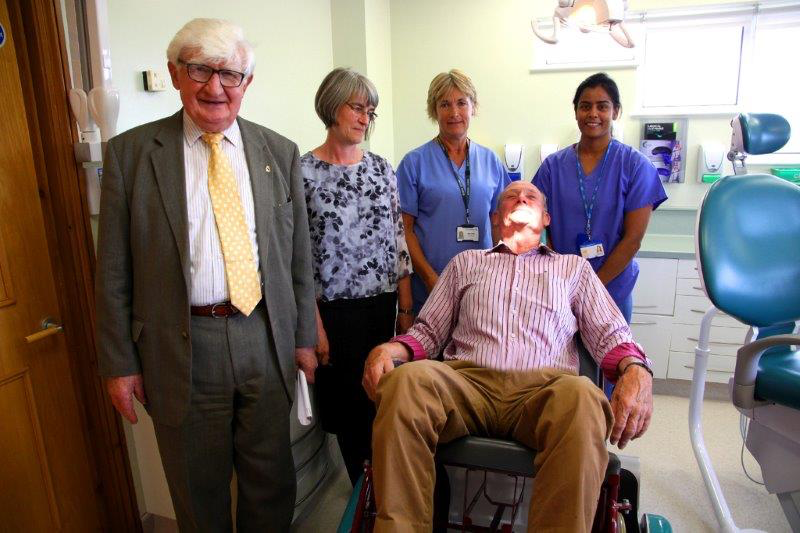 To remind you of the L o F’s on-going support for the hospital, the League handed over some new equipment to the Special Needs Dental unit working in Uckfield. As you will appreciate many patients with disabilities, in some cases combinations of, physical, cognitive or mental health problems, find using a standard dental operating chair difficult. This is not only because of their physical comfort but also getting in and out of the chair safely. The one group who are particularly at risk are those who are the so-called “bariatric” patients, who are morbidly obese and frequently have motility problems as well. The Dental Unit had identified some excellent equipment, which has been designed and built locally, which would greatly enhance the patient’s comfort and safety. It was clearly also of a great help to the dentist and nursing team. Like all good ideas it is simple and effective. 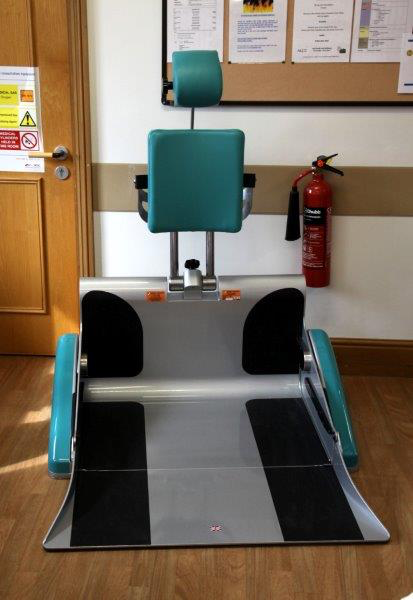 It can be used as a substitute for the dental operating chair or help to transfer the patient into the chair. As you can see even our Chairmen enjoyed the experience and he has a very normal BMI! 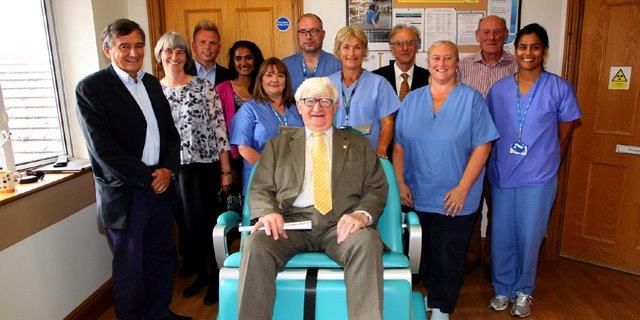 The chair is handed over to the dental team. A few members of the L o F as well as the designer and manufacturing team are also present. Bernard Trew has difficulty filling the chair, on this occasion! The large robust chair is easily moved into a recumbent position and has a head support with almost limitless positions. Dr Leona Toner, Head of the Special Needs Dental Department, casts a caring eye over a very relaxed Chris Macve from the L o F. This is using the equipment to transfer the “patient” on to the regular dental chair. Clearly this type of equipment may find a use in other departments for the care of bariatric patients. The League of Friends is always happy to support and innovate where it can, to help make the patients have a more comfortable less stressful visit to Uckfield hospital.